For many fans, Nats' opening day was marred by chaotic, long lines for food, dysfunctional ATMs, and confusion and bottlenecks near the exits. The team blamed technical glitches. WASHINGTON — The rain held off, Bryce Harper homered and the Nationals bested the Marlins 4-2 during their home opener Monday. 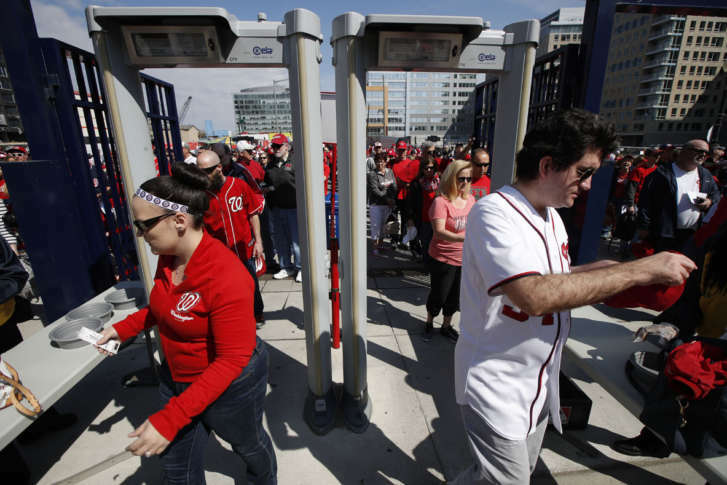 But for many fans, Nats’ opening day was marred by chaotic, long lines for food, dysfunctional ATMs, and confusion and bottlenecks near the exits. Are you a Washington Nationals fan? 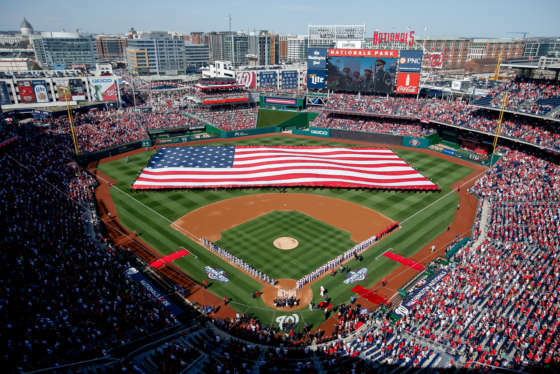 Show WTOP your “Natitude” and share your opening day photos. In a statement provided to WTOP, the Nationals acknowledged falling short of offering a “first-class fan experience” on Opening Day. Many disappointed fans took to social media to vent their frustrations. Other Twitter users griped about “terrible service.” One fan said she stood in line for a hot dog for nearly two innings and only saw Harper’s sixth-inning home run on the monitor. Worst @nationals opening day ever. Long food lines. Terrible service. No one is ready for the crowd. Opening Day typically draws a sellout crowd. Monday’s crowd topped more than 42,000. But fans say the general disorganization seemed worse than previous years. One of the points of frustration was the process to pick up the free magic eight ball being offered as a giveaway to Opening Day fans. In previous years, fans said they could retrieve the free prizes upon entering the ballpark. But on Monday, the giveaways were available only after the 7th inning and only to fans exiting the park. That appeared to lead to confusion and some crowding at the exits. Giveaways were handed out in according to guidelines from Major League Baseball covering some giveaways, according to the Nationals’ statement. The MLB guidelines only affect the handing out of some items and will not impact bobbleheads, a spokeswoman for the Nationals said. The next giveaway is a Daniel Murphy bobblehead, which is set to be handed out during the April 14 game against the Phillies. @Nationals I’ve been to many opening days and playoff games and never seen concession lines this bad. Shouldn’t take 20 mins for popcorn. @Nationals Happy Opening Day…but the lines at concessions were ridiculous. Shouldn’t stand in the ecash line and miss 1/2 an inning!